자세한 Spec은 첨부File(Data sheet) 에서 확인하시기바랍니다. * GGG12864H-A : STN Y/G, Positive, SPLC502B, BLU(Y/G,Vf:3.0V). GGG12864H-B : STN Blue, Negative, SPLC502B, BLU(White,Vf:3.0V). 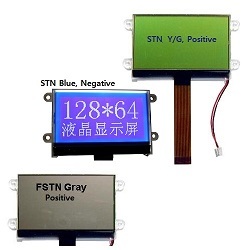 GGG12864H-C : FSTN Gray, Positive, SPLC502B, BLU(White,Vf:3.0V). 자세한 사이즈는 모델별 도면 확인하세요.